Life is just rushing by and I haven’t had a chance to finish updating our sponsors and friends about all of the exciting things that happened while we were in Haiti this summer. To finally continue, in this post, my son Brennan will share with you the story of the basketball hoop. I really like basketball and since other people do sports ministries, like our friends Luke & Becca who have a soccor ministry in Malawi, that got me wanting to do something with basketball. I was able to raise money by collecting donations and doing jobs to earn money. Most of that money went toward the cost of the trip, but I also earned some extra to pay for the hoop. Then I found out that someone donated it! When we got it there I couldn’t wait to put it up, but we had to wait until Tuesday because that’s when the rest of the team would be there to hang it. When we got to Carrefour Poy, we saw that the wall wasn’t high enough for a basketball hoop and the ground was muddy and rocky with roots sticking up from a nearby mango tree. 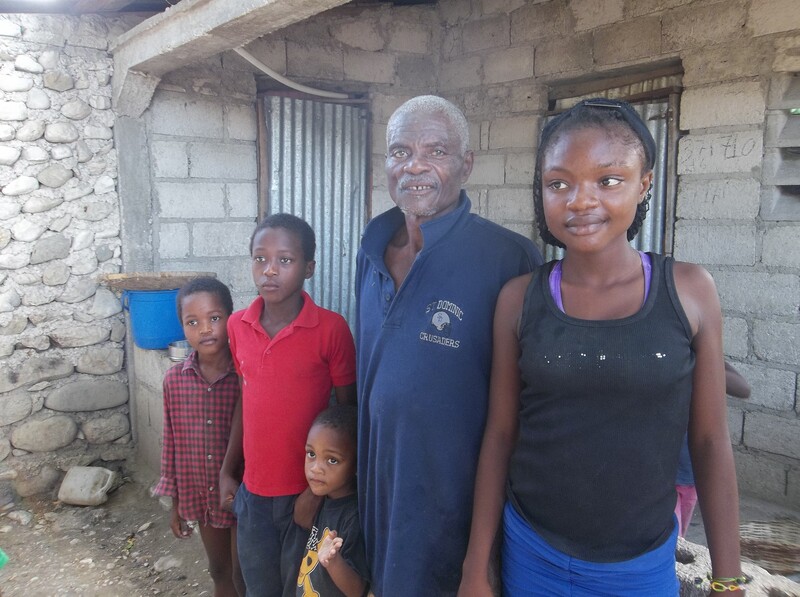 We talked to Claudel and Pastor Gilbert who made some phone calls that we couldn’t understand. Discussing the placement of the court. After a while, the man who lives next door to the school came with an ax and began chopping up the roots. Monsier Lebreton chopping out the tree root. Then he skillfully climbed the tree and chopped down a branch that was in the way. 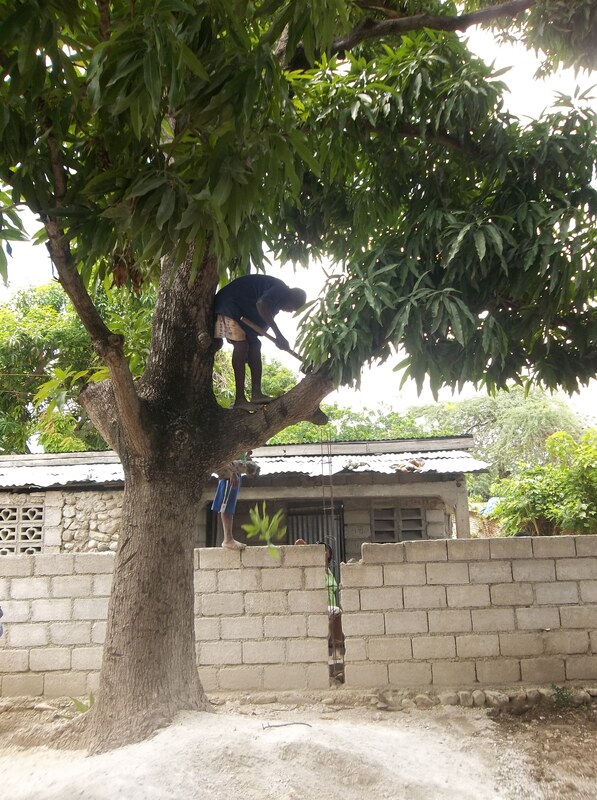 Chopping down a branch from the mango tree to make space for the basketball court. While he was doing that, someone drove away in Gilbert’s car and came back with a trunk load of bricks. 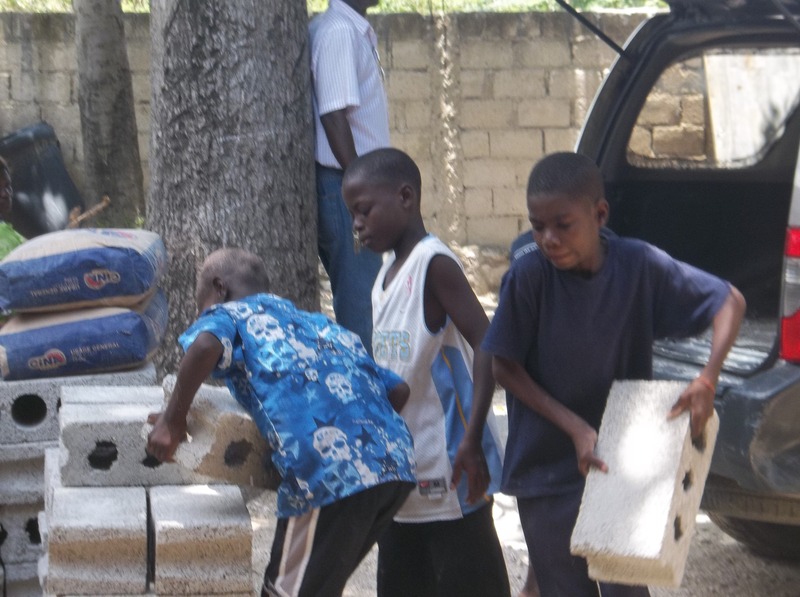 Some of the school boys unloading bricks from the back of Gilbert’s car. 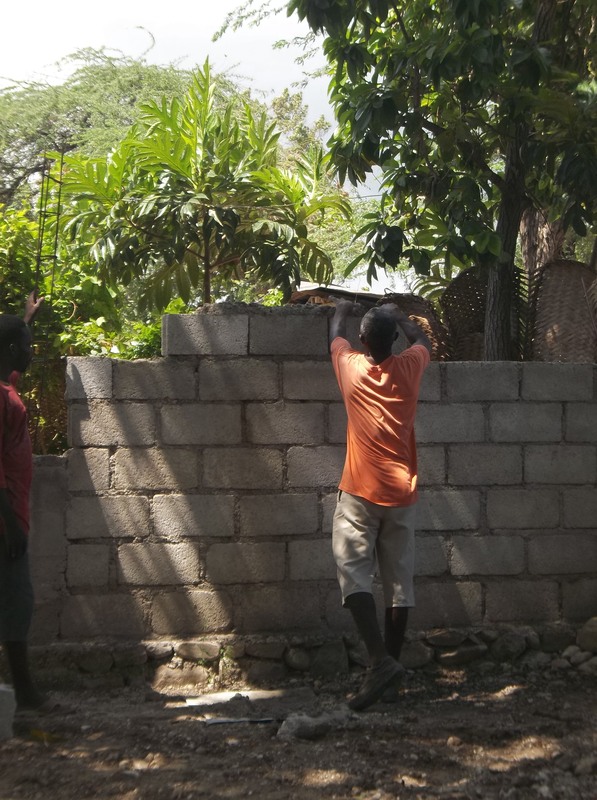 After the bricks were unloaded, some men from the village started building the wall. so the wall could be built up! 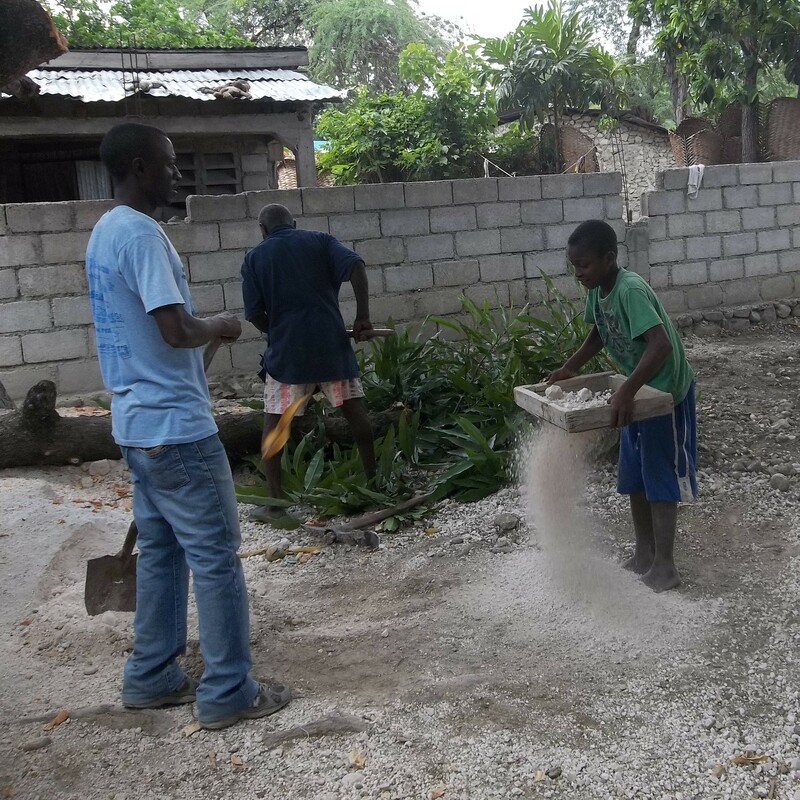 Then, one of the kids who goes to the school started bringing wheelbarrows full of gravel to use for the cement for the court. Thankfully, the money I had raised for the basketball hoop was available for all the supplies and to pay the people who did the work! By then it was late and we had to go back to Gilbert’s house, so unfortunately we weren’t able to see the cement being poured. The next day the rest of the team arrived in Haiti and I was very glad to see other kids who spoke English! While collecting all the luggage at the airport, we found out it had been quite an adventure getting the basketball hoop there. The airline workers said that they can’t transport that big of a box. After a long discussion trying to come up with solution, Christian, the leader of the team, asked if it could be transported out of the box. The lady said “Yes, of course that will work.” So they took it out and put all the bolts and brackets in separate suitcases. Thankfully, it all got there safely! All ready for the hoop to be hung! 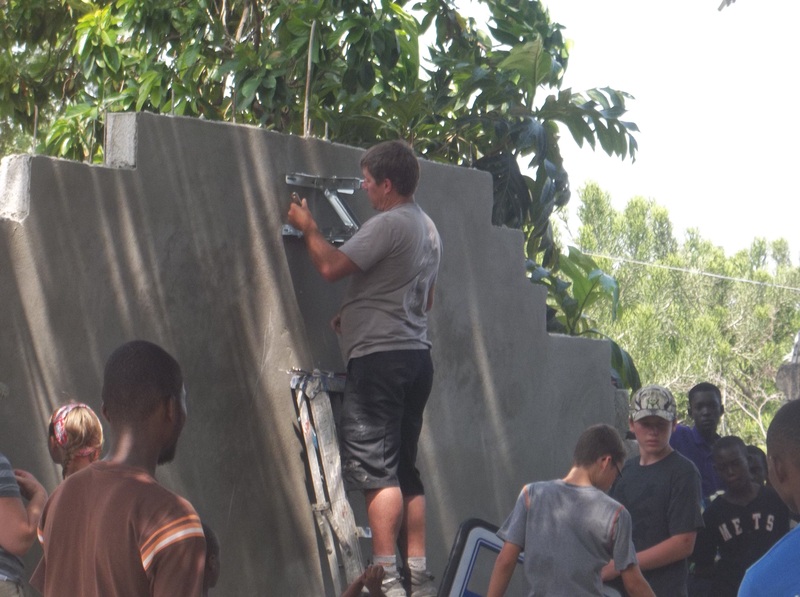 On Tuesday when we got to Carrefour Poy to teach VBS the wall and cement was all finished and ready for the hoop to be hung! After the VBS was over, several of the team members and I put the basketball hoop up. While we were working, we discovered that the battery powered drill that Gilbert had wasn’t strong enough to drill through the cement wall. We had to get another drill and plug it into the generator that they have at the school. Brian securing the brackets to the wall. After all the bolts and the framing were installed, I got to attach the backboard. I also got to put the netting on the hoop before it was attached to the backboard. Kyle, Brian Sr., Brian Jr., Brennan and Christian on the court with a group of kids in Carrefour Poy. All the kids were so happy that once the basketballs were pumped up, we immediately started playing. 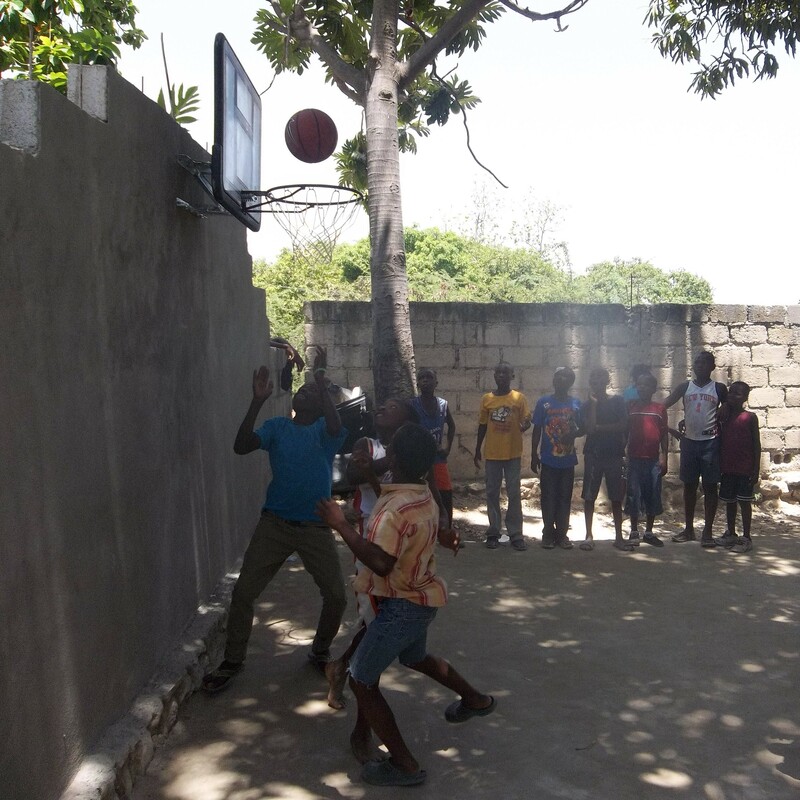 Even though the Haitians didn’t know all the rules, they knew the gist of the game, and we had a lot of fun! A group of kids enjoying the basketball court! 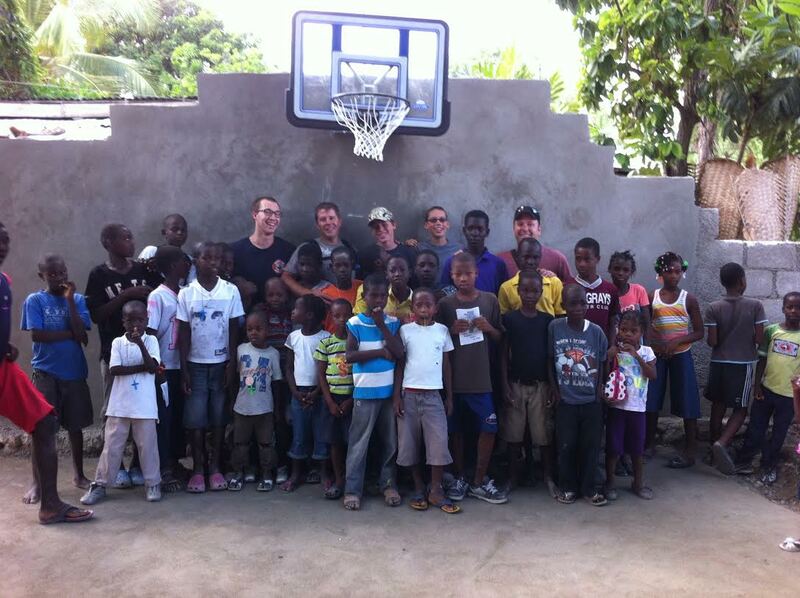 *Special thanks to Mike Stromberg, Brian Whaling Sr and Jr, and Kyle Catto for helping with this project, as well as the whole team for making sure the hoop made it to Haiti! 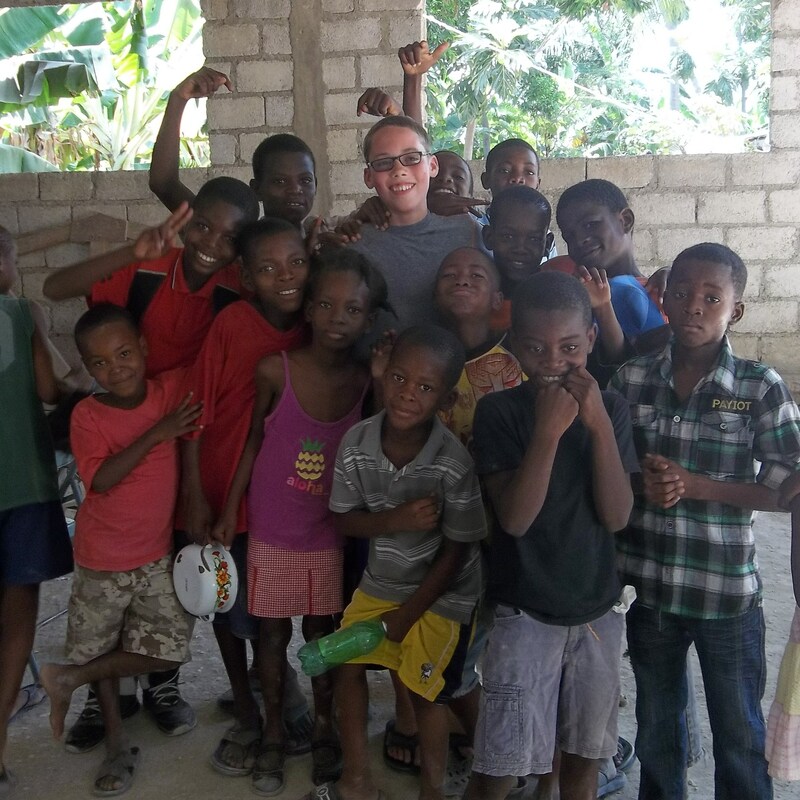 So much was accomplished in my 10 days in Haiti. In my last post, I was unable to figure out which details to share and which to leave out and so I ended up just writing a brief overview. Now I am going to attempt to share the main points of interest in a few posts without turning this into a 47 part series! So many things happened that I want to share with you all, that it will be an exercise in restraint. My first priority for the trip was to meet with every child who is sponsored through The Bridge. I had asked our sponsors to provide me with a note of encouragement for their child, a picture of themselves and if possible, a small gift of some sort. 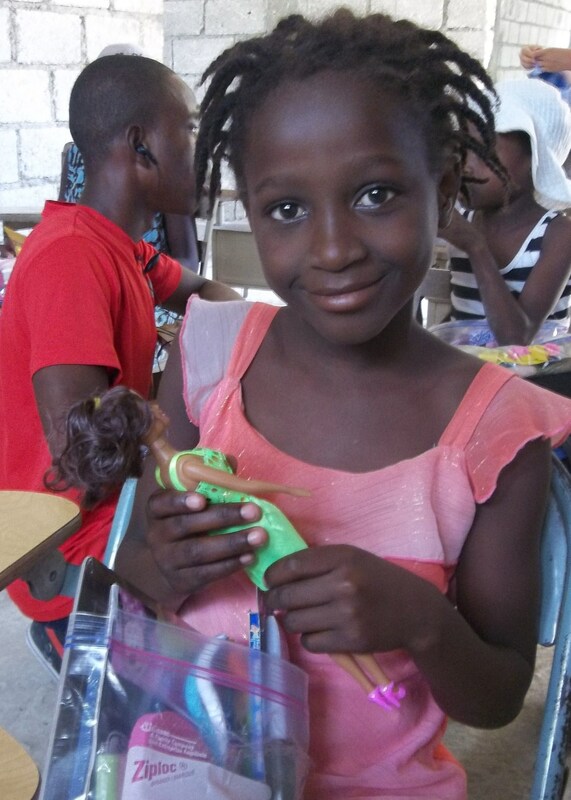 Ronaldina loves her new doll! I know our sponsors truly care about the children they sponsor and I wanted the children to be able to connect with them; to understand that they are a real person who not only is paying for their education, but also thinks about them, prays for them and truly cares for them. So, my first two days in Haiti consisted of meeting with the children and delivering those gifts to them. It was a joy to watch the children open their gifts and to see their smiles! 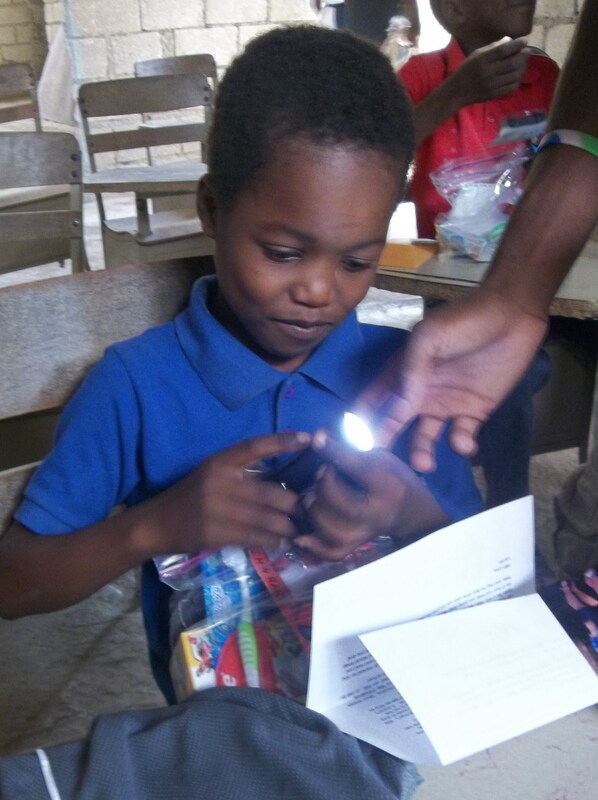 Monel was excited to have his own flashlight. I am keenly aware of the fact that what these precious souls truly need is food, water, an education and most importantly the Gospel of Christ. These are the reasons The Bridge exists. I guess my hope and prayer is that somehow the love of Christ will shine through the generosity of our sponsors in the gifts they sent. Claudel, Sander and Alix helped the children write thank you notes after they received their gifts. After meeting with all the children who were available in those first two days (there were just a few who were away or sick), I visited a few of the families at their homes to invite them to a meeting for the families of The Bridge kids. As I didn’t have time to go to everyones’ house, (well, really I quickly became worn out from walking around the village in the heat and humidity), Claudel invited the rest of the families. This household consists of a father, daughter and 3 brothers who are either cousins or friends of the family. Several months ago, I was praying over this trip & asking the Lord to clarify the things He wanted me to do. During that prayer, I had the thought to invite the families of our sponsored kids to a meeting to talk to them about The Bridge program. Along with that thought came a very brief outline of four points to share with them. Now, anyone who knows me, knows that I HATE to speak in front of people! I wasn’t sure if this was really what God wanted me to do, but besides that, I wasn’t even sure it was something I could do! Nonetheless, I wrote down the four point outline & kept it to pray over. Eventually I asked a couple other people to pray about it also and I mentioned it to Gilbert and Claudel as something we could do if we had time while I was there. As the time drew near, we scheduled the family meeting into the trip, but I still didn’t know what I was going to say about the 4 points that God had originally given me. Finally, 3 days before I left for Haiti, I sat down at my computer & filled in some details about those points. I woke up the morning of the family meeting feeling paralyzed with fear. I emailed a few friends to ask for prayer and then I prayed, read scriptures, and reviewed the message I would be giving, but my nerves would not calm down. During the whole long drive to Carrefour Poy that day I felt sick with anxiety. The youth group team prayed for me also before I left them in Bellanger where they were teaching VBS that day. Claudel helped to serve the meal after the meeting. And then, when I got out of the car in Carrefour Poy, I had a minute to check on the cook who was preparing the meal we were serving the families before I was taken into the main church building and it was time. In that moment, my nerves calmed, and I was able to share the message I believe the Lord wanted me to share. It wasn’t a long or particularly deep message. It was all about the fact that we, as sponsors, love their children because of Christ’s love for us. 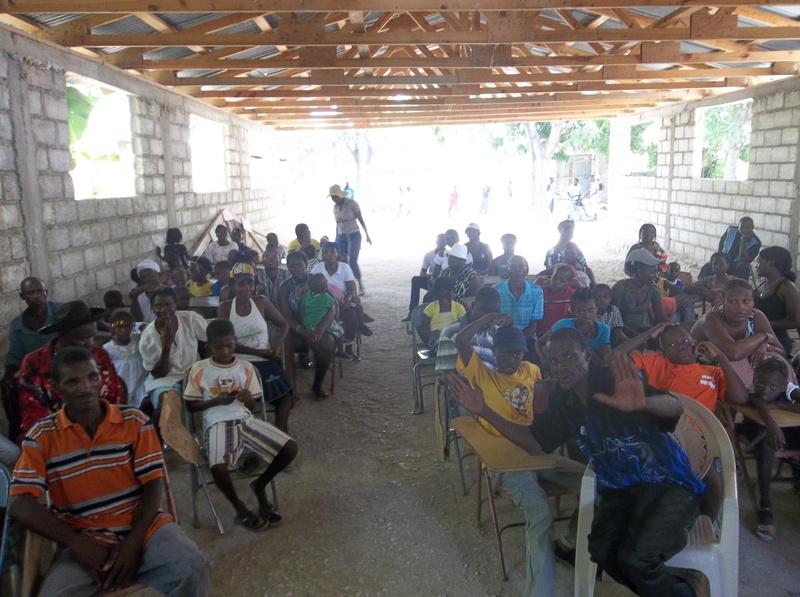 I talked about the importance of the children for the future of their community & the beautiful country of Haiti. I talked about the importance of their role of influence in their children’s lives, the importance of education, and that we all- the children, their families, the teachers and the sponsors are all a team working together toward the goal of helping each child reach his or her potential. Somehow I had the presence of mind to snap this picture of my audience right before I started speaking. Then I reminded them that we do this because Christ first loved us and I shared a short and simple Gospel message. I had just finished sharing the Gospel and was about to finish my message when one of the fathers who was there stood up and began talking loudly while flailing his arms around. I have met this man a few times before and he is one of the local voodoo priests. I don’t know if he had ever been in a church before, so I was so glad to see that he had come. I don’t really know what he was saying, perhaps he was just talking nonsense, because pretty quickly after he stood up the rest of the audience was trying to shush him and get him to sit back down. As I watched him, I thought for a moment that maybe he was calling curses down on me, and yet I felt completely safe and at peace, knowing that God was protecting me. I ask that you join me in prayer for this man and his family. Specifically, that the Gospel message would take seed in his heart and that he would respond to God’s call. 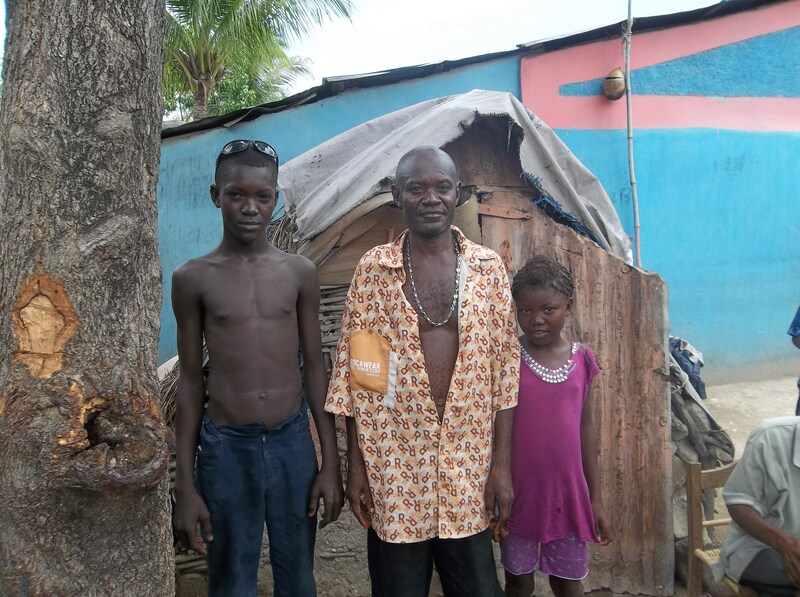 The voodoo priest with two of his children, both of whom are sponsored through The Bridge. After the voodoo priest settled down and I finished my talk, I asked the families if they had any questions for me about The Bridge program. Several people raised their hands, and although there were a couple questions, most people simply wanted to express their thankfulness to those who are sponsoring their children. I wish you all could have been there with me to see the gratefulness in their eyes as they told stories of not being able to afford books or uniforms or even tuition, and the hope that they now have for their children’s future thanks to your generosity. From the children and their families, from Claudel, the teachers, Pastor Gilbert, and from me… Thank you. 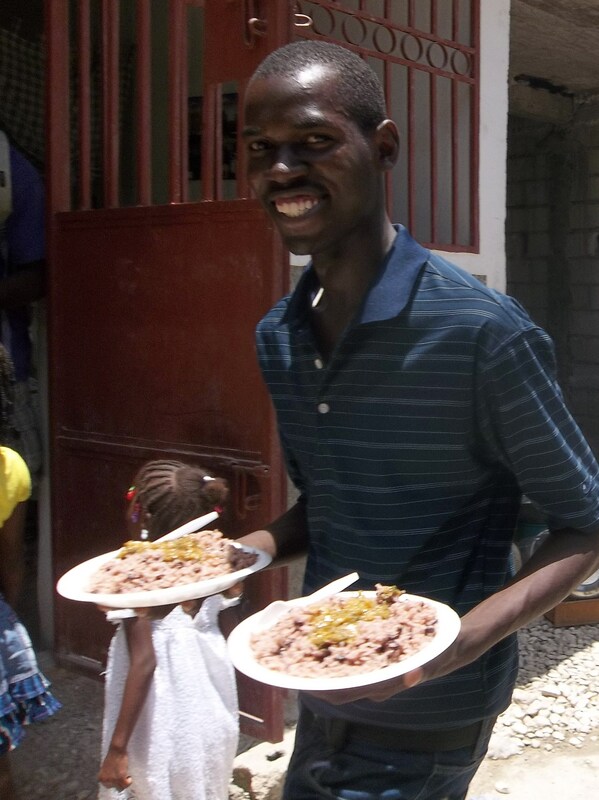 The first time I went to Haiti, I was on a spiritual and emotional high the whole time. I was not sure what to expect this time, but I had a feeling it might not be the same mountain top experience it had been the first time. I struggled a lot during this trip with discouragement- questioning whether this little program is really doing any good. I was very tired during most of the trip and I just plain missed my family. Ten days was a long time to be away from my husband & youngest son. I also saw many things that just broke my heart. 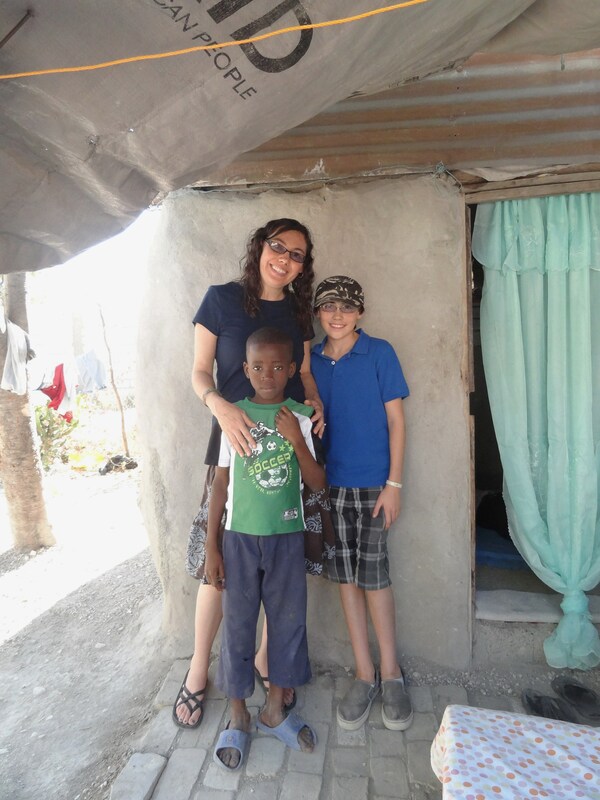 I witnessed and experienced the spiritual battle in Haiti. I was and am abundantly thankful for all those who prayed for me and for this trip. I felt God’s protection surrounding me. Despite the struggles I experienced, it was really a great trip, filled with many moments of joy! Loving being surrounded by these beautiful kids! I loved having the opportunity to spend some “down time” in Carrefour Poy, which I did not get on my last trip. I had time to watch the children play, to talk with them, to hold them. These are some of my favorite memories! It was a huge blessing to meet with all of the sponsored children as well as some of their families and hear a little about how The Bridge is making a difference in their lives. The family of some of our kids in front of their home. I loved sharing this experience with my middle son, Brennan. I loved watching him communicate and make friends with all the children in spite of the language barrier. Seeing all the people I met on my last trip was a treat. So many friendly faces, and I count it a privilege to get to work with some of them. It was great driving around with Gilbert. I received the benefit of his wisdom and learned a lot about Haitian culture & ministry in general. It was also exciting to brainstorm new ideas of how we can continue to help the school in Carrefour Poy with him & dream about even bigger things for the future of this ministry! I will be writing a little about some of those things in a future blog post. 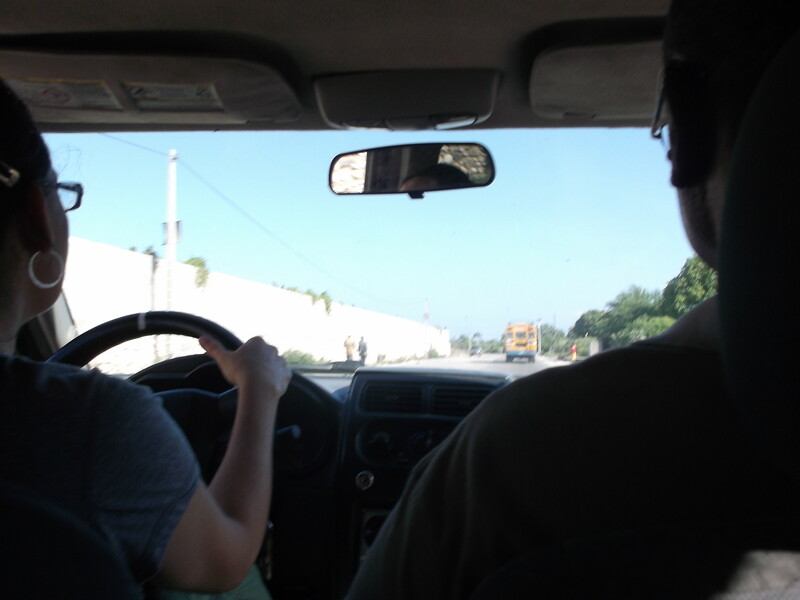 In the car with Gilbert… and this time I got to drive! What a blessing it was to watch our youth group & the leaders ministering to the children of Carrefour Poy. There were so many little difficulties on this trip (and a few big ones), but I rarely heard complaining but instead witnessed a lot of smiles and the love & joy of Christ pouring through our team to the children they were ministering to. And in a few of the team, I had the privilege of witnessing the spark of God’s call in their hearts to do more. I can hardly wait to see the outcome of those sparks! These are just a few of the great team of youth that ministered in Haiti last week. So many wonderful and exciting things happened on this trip… too many for this one blog post. I will be sharing more about those exciting things in the near future. Read more about my trip in this post about The Children and their Families. 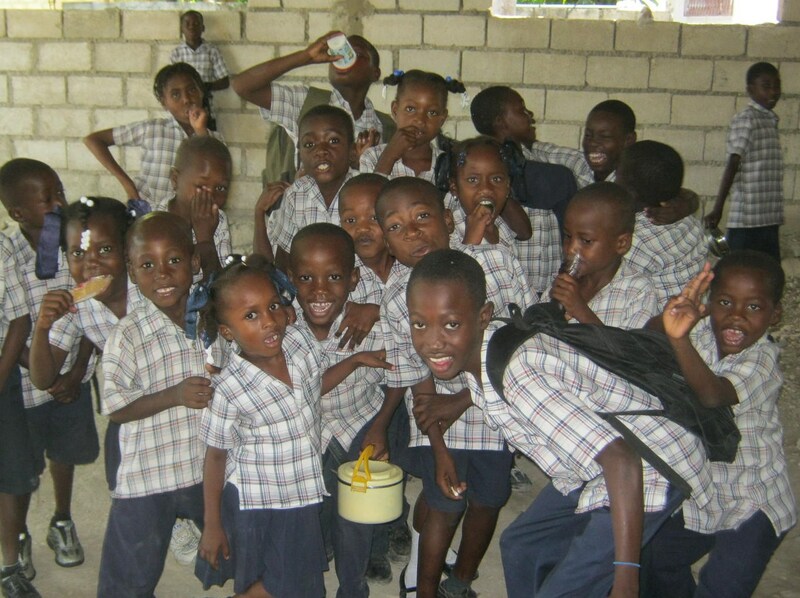 9 days till we leave for Haiti! And my heart did a little somersault in my chest. 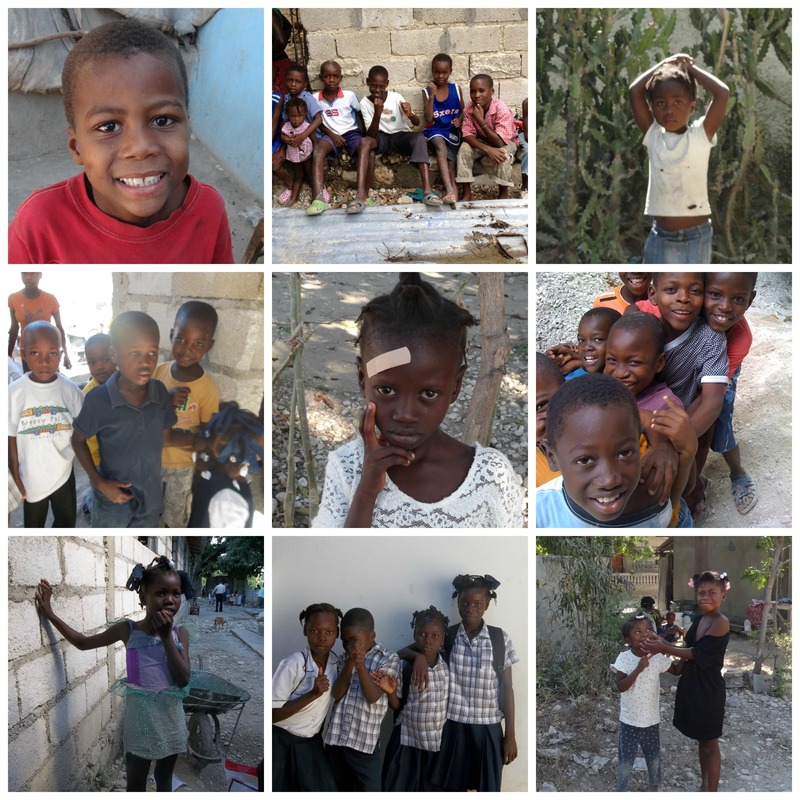 I have been very busy preparing all the little details for this trip, but in quiet moments, I take time to remember some of my favorite moments from my last trip and allowing myself to feel the excitement, anticipation and privilege of getting to go to Haiti a second time. There are so many things I am looking forward to. A few of the sweet faces I will get to see! 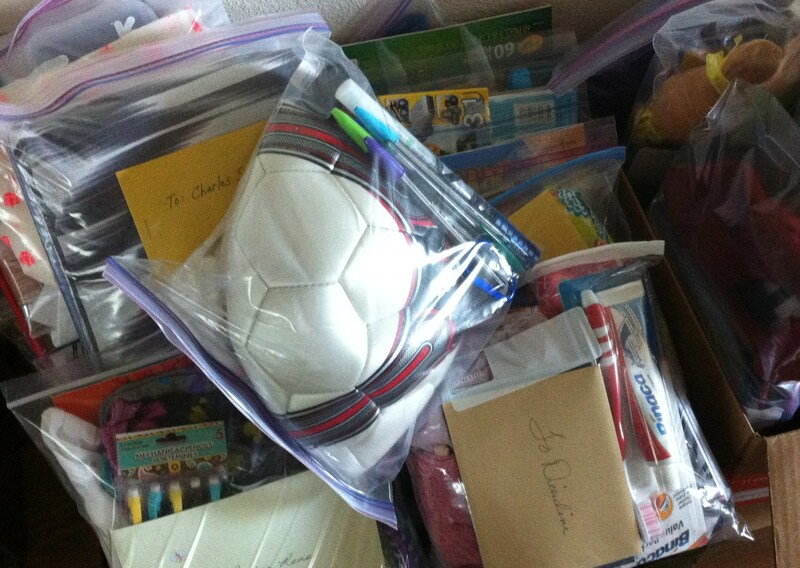 Clothes, toothbrushes, dolls, hot wheels, notepads and pens, a soccer ball and even a life straw! I am blown away at the generosity of our sponsors! Family members of one of our sponsored girls. and sharing some of these experiences with my two oldest kids and a great group of youth and adults from our church! 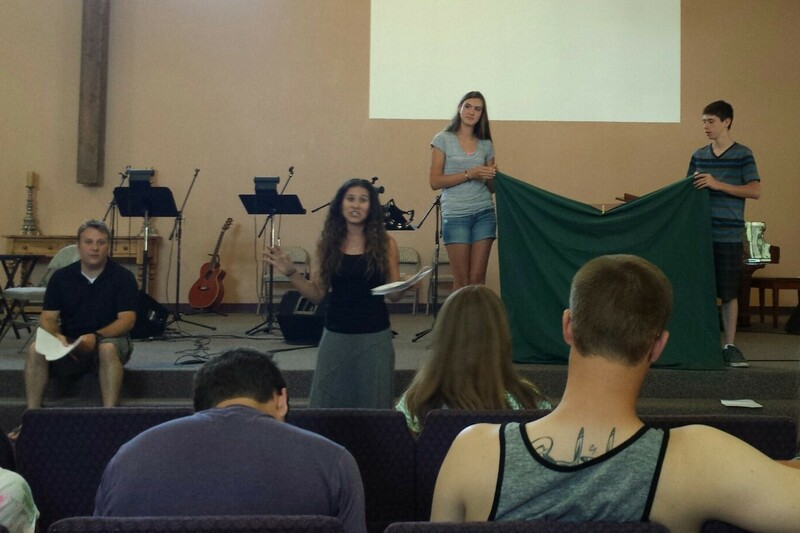 Desiree from That None Shall Perish training our youth team on teaching VBS. This trip is mainly a Youth Group trip with the purpose of teaching VBS to children at Pastor Gilbert‘s 4 different churches. 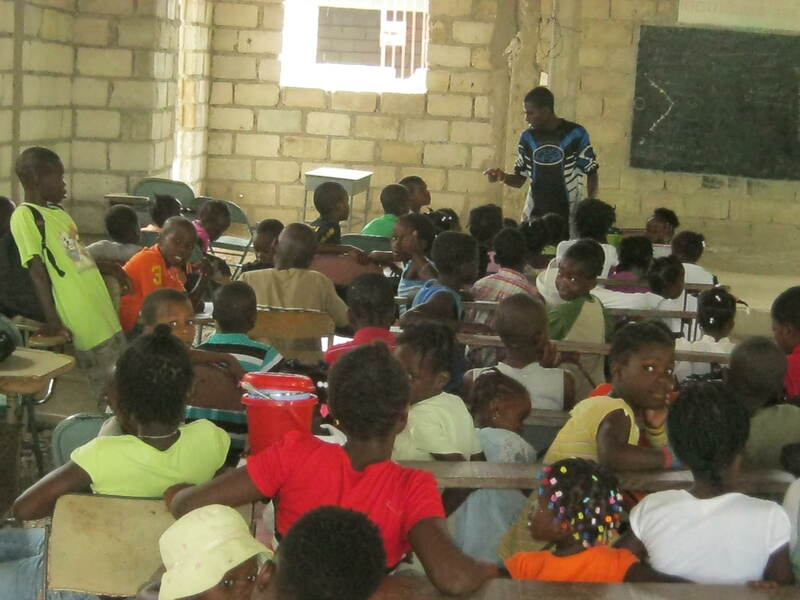 We have a great group of kids going on this trip who will be sharing the Gospel message with over 1000 Haitian children! What a life-changing experience! 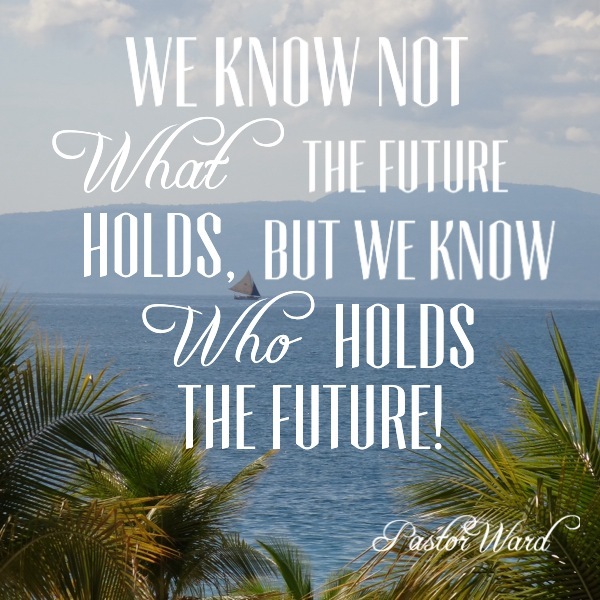 Hopefully… prayerfully… life-changing for both our American team as well as all the Haitian kids we will get to meet! My son Brennan and I will be leaving for Haiti a few days ahead of the rest of the team so I will have time to meet with all of our sponsored children. I will also have the opportunity to meet with the families of our sponsored kids to discuss the Bridge program with them, answer any questions they might have and discuss with them the importance of their role and influence in the lives of the children in their care and the importance of the children themselves- and their education- for the future of Haiti. I also plan to deliver a curriculum which was written as a follow-up to the VBS which our youth will be teaching. 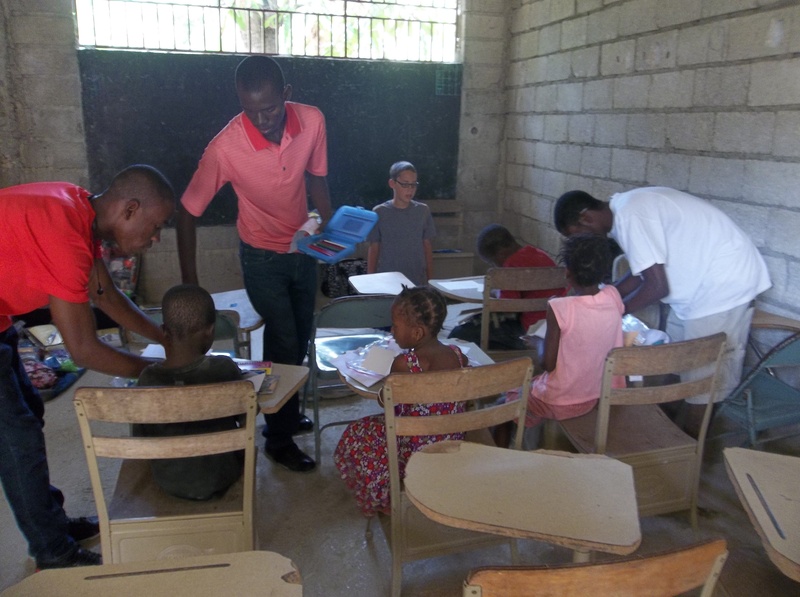 This is a great curriculum which has been translated into Haitian Creole so it can be taught to the children of Carrefour Poy by the teachers at the school after we leave. It is called The Colors of Salvation and reinforces the message which will be taught by our youth, going into more detail about the Gospel. We will be delivering 5 teacher’s manuals plus all the coloring books, craft materials and supplies needed to teach the curriculum. 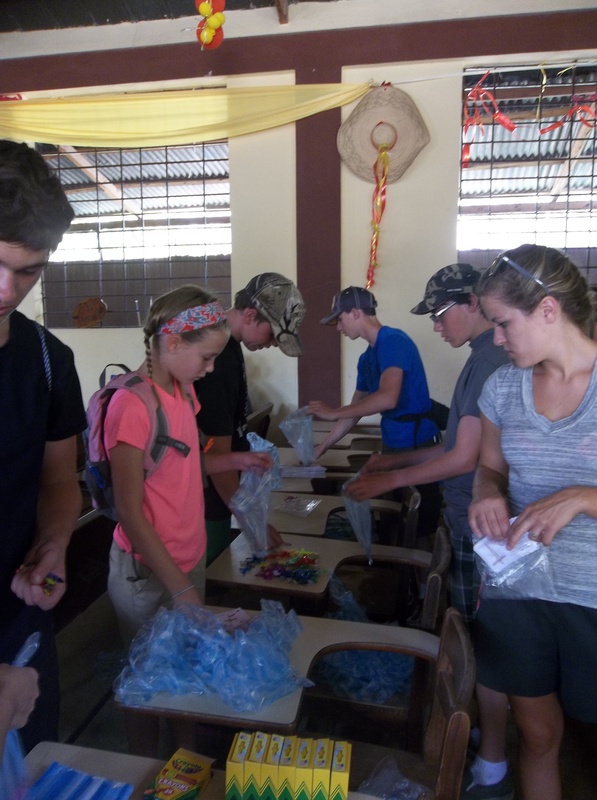 At the end, each child will get to make 2 bracelets with colored beads representing different parts of the gospel story. One bracelet is for them to keep and one is to give away and share the message! As I deliver the materials and curriculum, I will have the opportunity to walk through the curriculum with the teachers to make sure they understand how to use it & share some teaching ideas with them. Claudel is planning to use it as a summer school program after our team leaves and before the next school year begins in October. The Colors of Salvation in Haitian Creole! I am also very excited to get to help out the youth team with VBS in Carrefour Poy. I am really looking forward to having that time to spend with the children of Carrefour Poy watching them learn, seeing more of their personalities and just playing with them! As you can see, I have a very full trip planned. And so many things to finish preparing before I leave in just 9 days! I know that God will bring all the little details together as He always does. I am so amazed at all the ways He has provided for this trip so far. So many people have invested in this trip in so many ways. People who have been praying, or spoken words of encouragement to me. Our sponsors, who are sending gifts to their children. 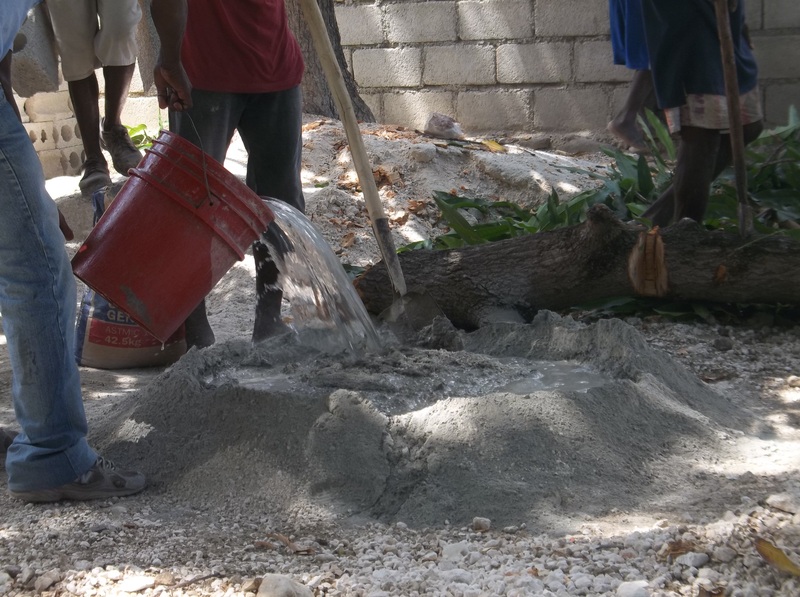 The many people who have been involved with getting The Colors of Salvation ready– from my friend Debbie King, the author of the curriculum, to the men who worked to translate it, to Mandaly of the Sweet Coconuts blog who is graciously editing it. So many people who have donated money, materials or time preparing materials. The youth who are going out of their comfort zones to bless all these children and will also be preparing baggies of the materials to make the salvation bracelets and helping me pack everything! And my family who has been so patient with me as I pile supplies and sponsor gifts and suitcases around the house. I feel so blessed by each you. So blessed to have the privilege of going to Haiti. So blessed to be a part of the worldwide Body of Christ. Jason & I with Madocher in January 2013… Looking so forward to seeing him again! This is one of those things that has been on my heart for a long time, but I don’t express nearly often enough. When I started working on this ministry 3 years ago, I had no idea what I was doing. I started out with nothing but a vision, a passion and a whole lot of prayer. And yet, a total of 15 families came along side me immediately becoming sponsors and about 10 more families joined us within the next few months. Every quarter, as I go through my records to send out quarterly reports, I am reminded of these families and their willingness to join with me from the very beginning and I am grateful. 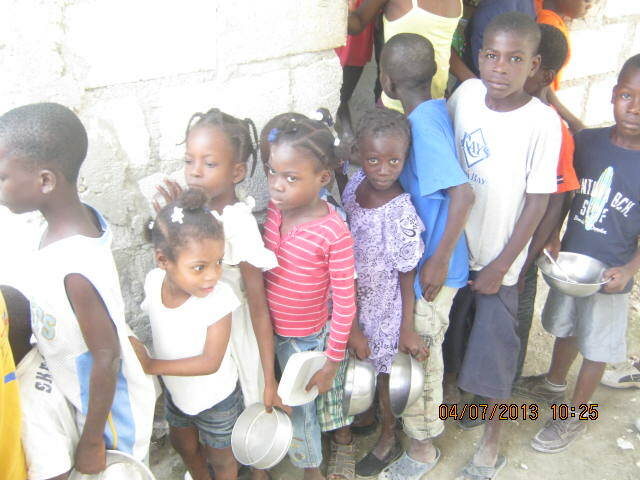 Happy Haitian kids getting food and an education through The Bridge! In the time since then, many others have joined us in sponsoring children, some of our original sponsors have chosen to sponsor a second child (or even more!). We’ve also had some whose financial situation has changed and have had to stop their sponsorship. But for each and every person who has participated in this ministry, I am grateful. There have been several people who have donated money to The Bridge for the food program or other needs the children of Carrefour Poy have. Some are sponsors and some do not have the means to send money every month, but have donated out of an unexpected abundance. These people have done much to fill the tummies of hungry children in Carrefour Poy and I am grateful for them. Sweet girls, grateful for food. 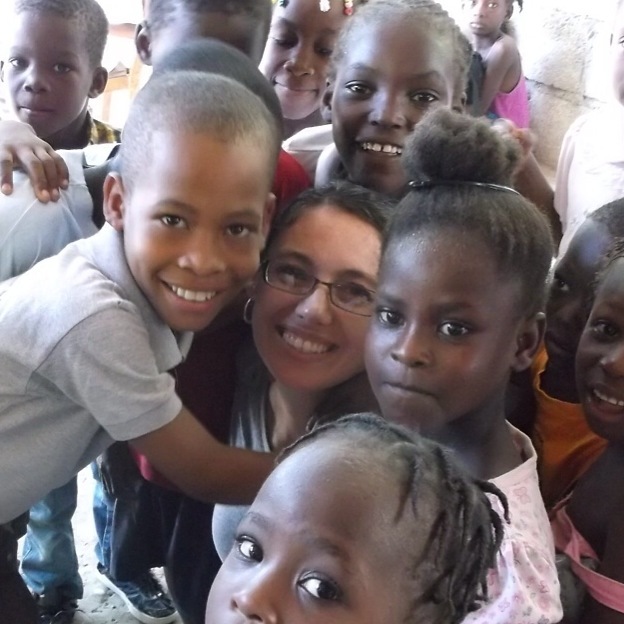 I am currently preparing to go to Haiti in July with two of my children as part of a youth group trip. I have been blown away at the generosity of people who have helped us financially prepare for this trip. At one point, I had been quite concerned that we would not have the means to pay for all of our expenses: airfare, room and board, transportation, translators, supplies, etc. I am truly grateful for the many friends and family who have contributed to help make this happen. I know there are many people who pray for me and for this ministry. Some are sponsors and some are not, but all have blessed me by sharing the burden of this ministry through prayer. For each of you, for each and every prayer prayed on my behalf or on behalf of the children of Carrefour Poy, I am grateful. Through this ministry, I have had the opportunity to meet friends I never would have otherwise. 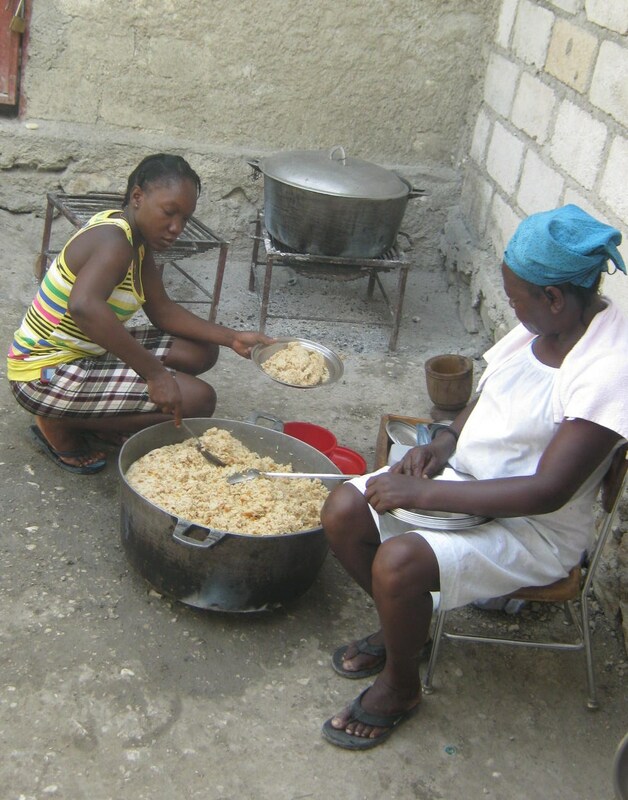 People who, though they may be of a different generation than me, share with me a passion for Haiti. People who have a passion for following God, no matter where He leads. People from a completely different culture, who I never would have had the opportunity to meet otherwise. 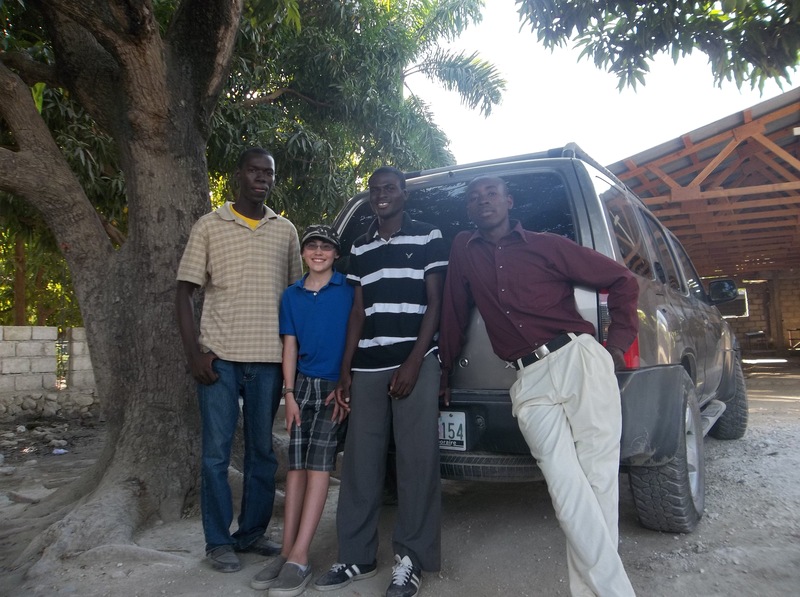 Haitian friends such as Gilbert and Claudel who have taught me so much about faith and joy in all circumstances. I am grateful for each of these people in my life. I am grateful for my family. For my husband who is my partner and encourager in life and ministry and for my children who share my excitement about serving in Haiti. 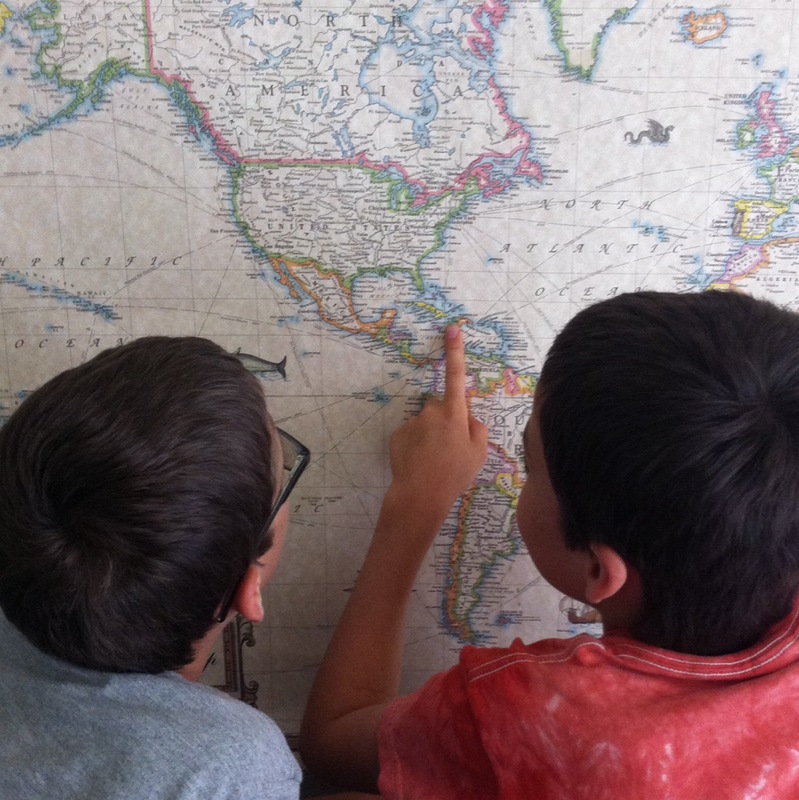 Two of my three boys, finding Haiti on the world map. Three years ago, I had no way of knowing what would become of this little idea. I just felt a burning desire to follow God where He was leading, so I did. I did not think much about the future at the time. 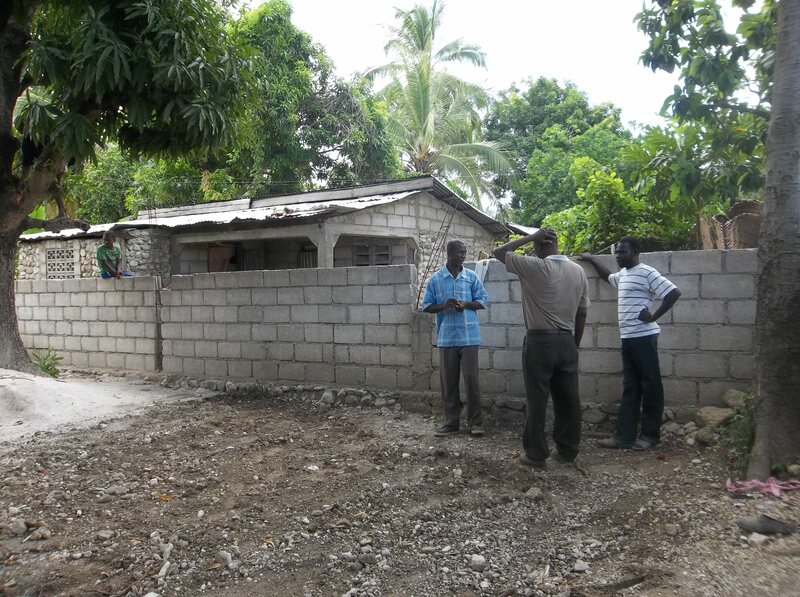 Would we help out this little village school in Haiti for a year and be done? Would it grow into something bigger? I didn’t know. When I think of all the people who have joined forces with me, proving their confidence in this ministry with their checkbooks, I am humbled. This is truly not a work of Wendy. Really, who would sign up to support that?? I don’t even think I would! Sometimes I question, can I do this? Am I good enough, organized enough, confident enough, to run a ministry? Let me be honest. The answer to all of the above is no. I am reminded that the confidence these generous people are displaying is not in me, but in God. 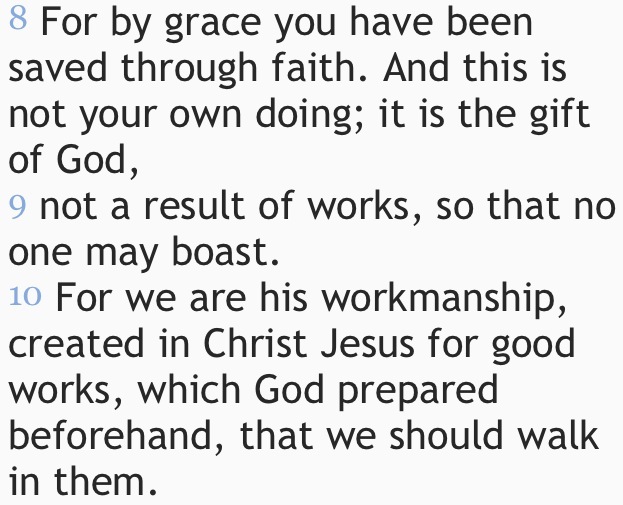 “Created in Christ Jesus for good works which God prepared beforehand…” Ephesians 2:8-10. One of my favorites. I have said it before and I will say it again. This little ministry is God’s from beginning to end. He has allowed me to play a part in it, he has brought new friends into my life through it. He has brought people alongside me to pray and to join in this vision. He has taught me many lessons of faith and trust through it. He has blessed me abundantly by allowing me to participate in His kingdom work. For all of these things I am grateful. But this ministry is His. And to Him I am abundantly grateful. 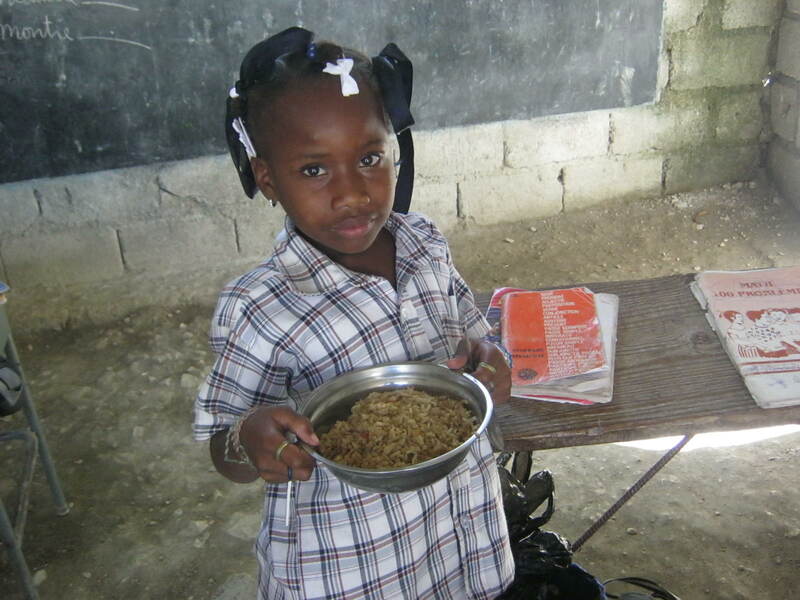 Praise God for providing FOOD for hungry kids! 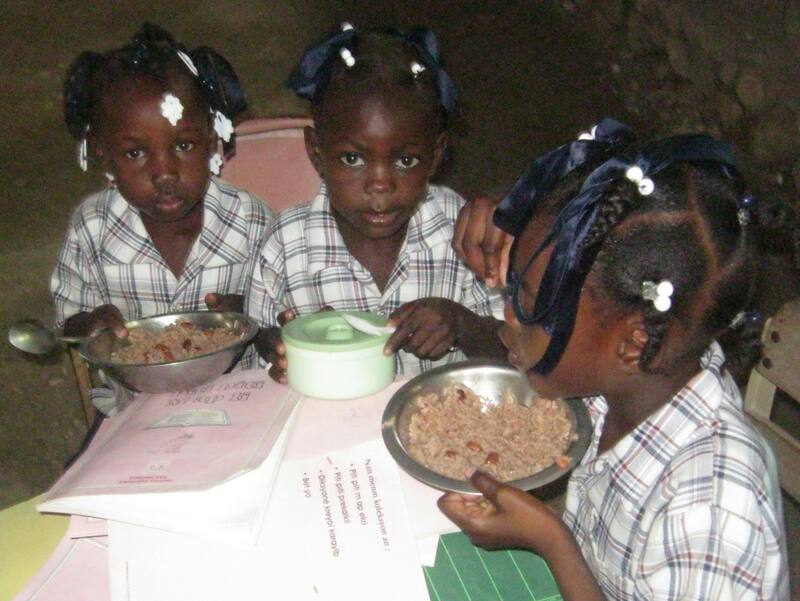 One of our goals from the beginning of this ministry was to provide food for the students at the school in Carrefour Poy. Pastor Gilbert told us that if we could get 100 kids sponsored, they could afford to feed the children a meal every day of the week. Unfortunately, we are a small ministry in a small community and our sponsorship rate has consistently stayed at around 35-45 kids. But fortunately, this is not our ministry, but God’s, and He will provide for His children in His own way. PRAISE GOD!!! 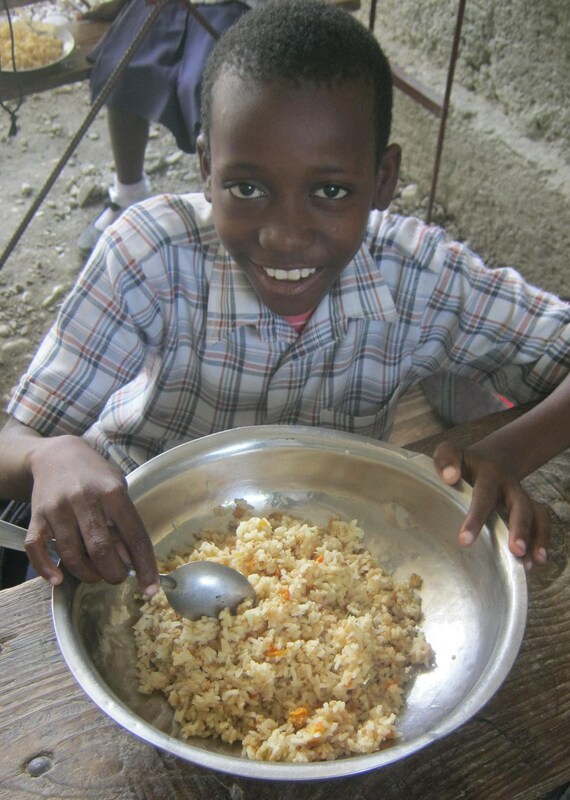 He is providing school meals for the children 5 days a week! Ready to face a day of schoolwork with a full tummy! Recently, the school in Carrefour Poy began receiving food from a ministry called Misyon Lespwa (Mission of Hope). Misyon Lespwa gives the school boxes of rice mix and the $250 food stipend that we send each month is spent on extra ingredients like oil and spices, as well as coal to cook with. 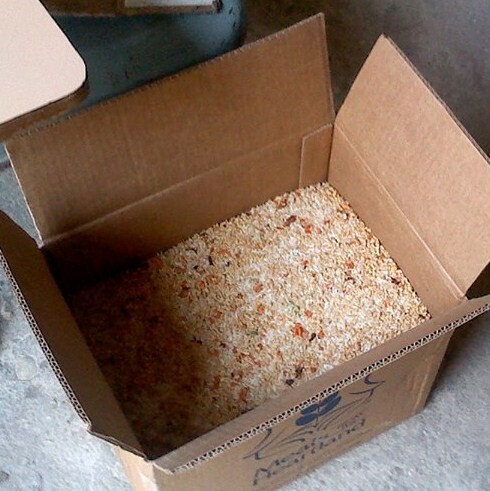 A box of the rice mix which is provided by Misyon Lespwa. It is an example to me, once again, of God’s sovereignty and how He brings His people together to accomplish His work. We are praising God for His provision! Serving up the cooked rice. Free school, free uniforms, free first aid, free books, all the above where mentioned by the parents to expose all the benefits they found in the school. There were many testimonies of gratitude toward the program. Many of them stated the fact that their children would not ever be able to go to school if it was not The Bridge. 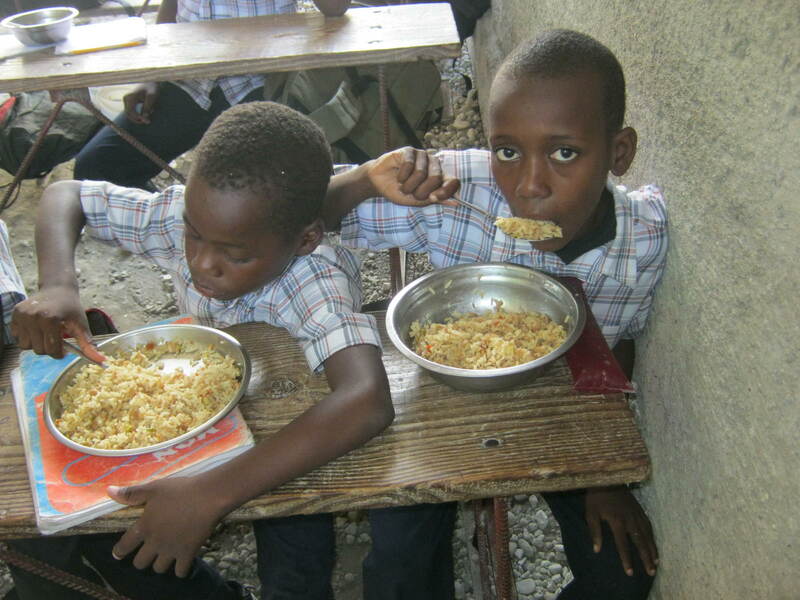 Many children used to cry when they stay home and se others going to school, this was the testimonies of some children to express their happiness for being in school the enjoy the classes; but, the food is exceptionally, because they go home with a full stomach. I have interviewed all the teachers this morning; positively, there is a great difference due to the fact now, they get the little salary on time. They really expressed their appreciation to Bridge for the sponsors’ help and support. Finally, the Bible training to the children helps them to know Christ. Hopefully, many of them will become Christians which is the main purpose of the Christian school. Special greetings to all the sponsors and all the church members for prayers and financial support. We love you, and we pray God to bless you. I would like to introduce to you my dear friend Claudel Romulus. 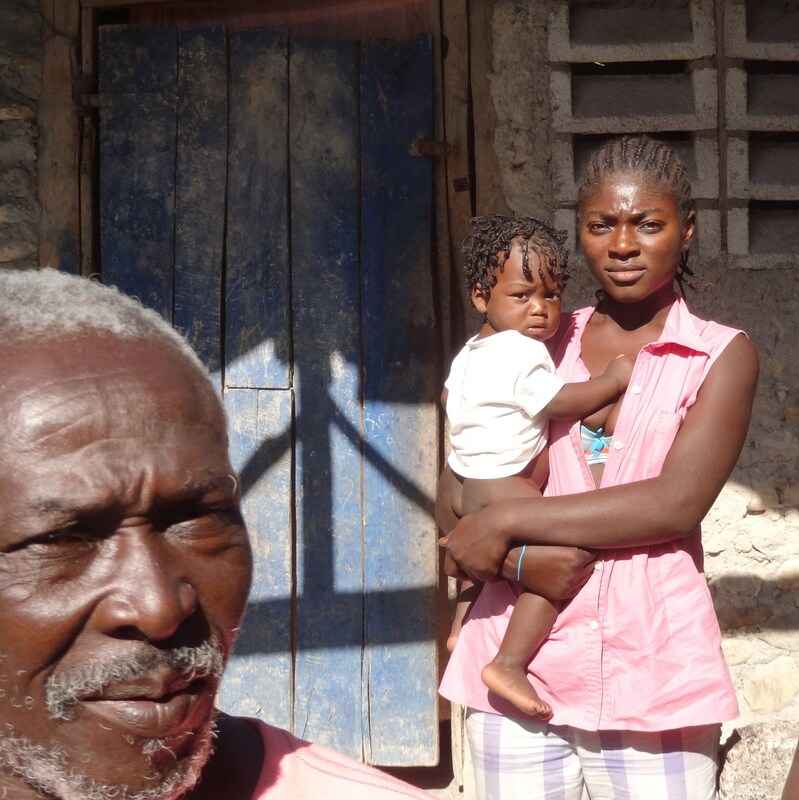 Claudel is the administrator of The Bridge Sponsorship Program in Carrefour Poy, Haiti. He is a very dedicated young man with a passion for affecting the future of Haiti through the spreading of the gospel of Christ and by the promotion of quality education. Claudel accepted Christ as a child at the age of 10 and was baptized at age 15. Shortly thereafter, he began teaching in the children’s Sunday school classes and later the adult classes. He is currently serving as the principal of Sunday School at the church in Carrefour Poy. Claudel lives in a small cement house with his father in Carrefour Poy. He also has a mother, two sisters and one brother who he does not live with. He tells me that his family is unable to live together because his father does not have the money to feed everyone in their family. 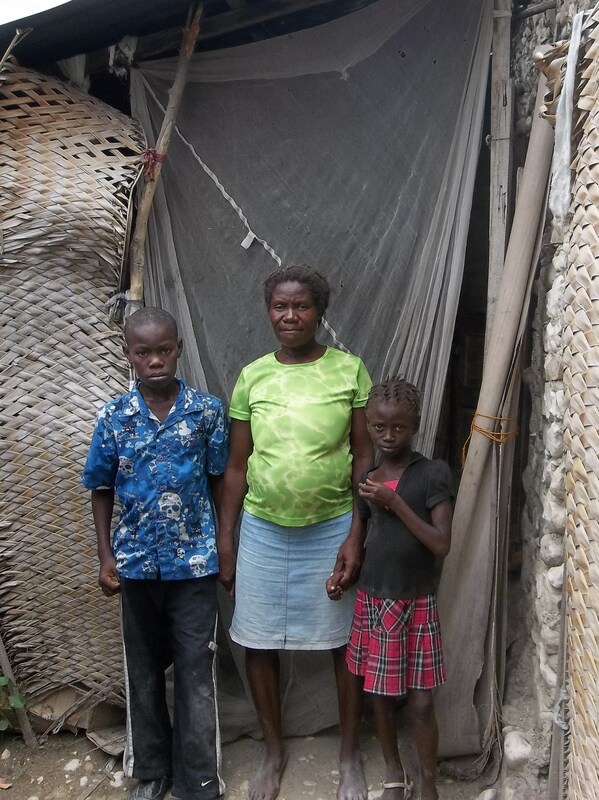 This is one example of how poverty affects families in Haiti. In my last blog post, I discussed the disparity between the dreams these children have for their future and the reality of the poverty they live in. Having grown up in Carrefour Poy, Claudel experienced that same poverty. His father tries to earn money by farming his little garden plot so he will have produce to sell in the market. And what are Claudel’s dreams? God has gifted and called Claudel to become a pastor. 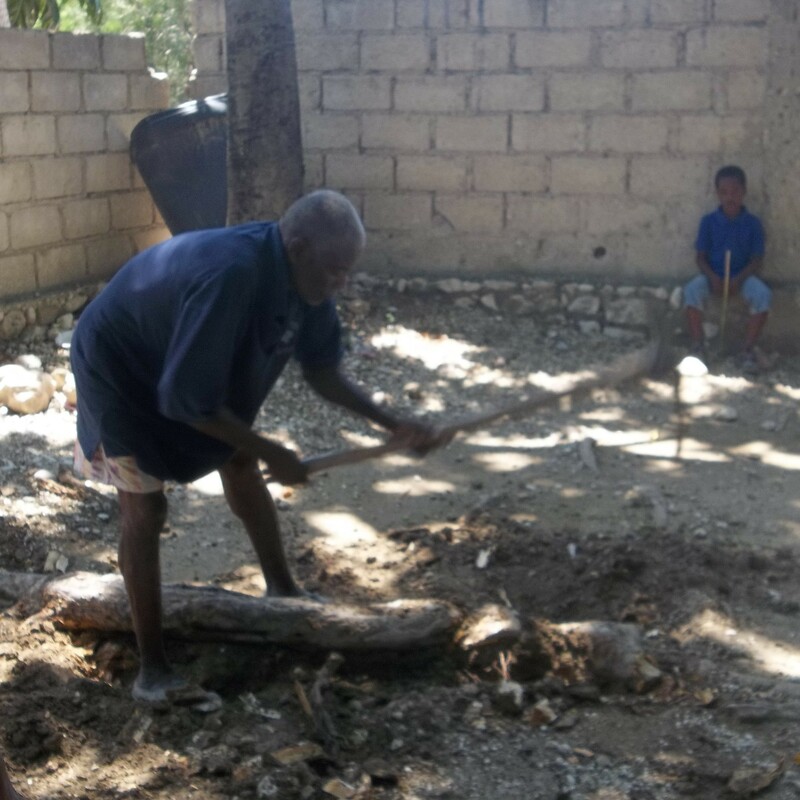 However, because pastors in Haiti do not earn a salary, he also wants to become a lawyer so he will be able to support himself. 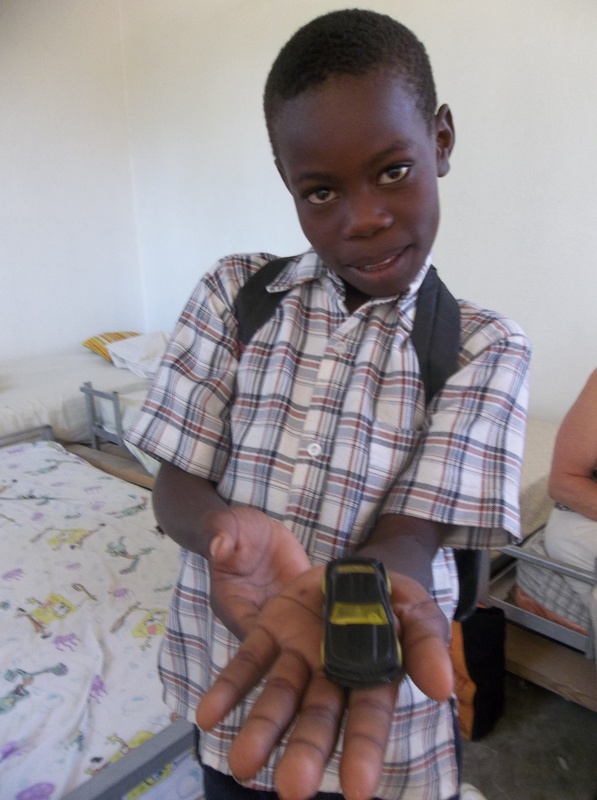 Thanks to God’s provision, both of these dreams are coming true for Claudel! 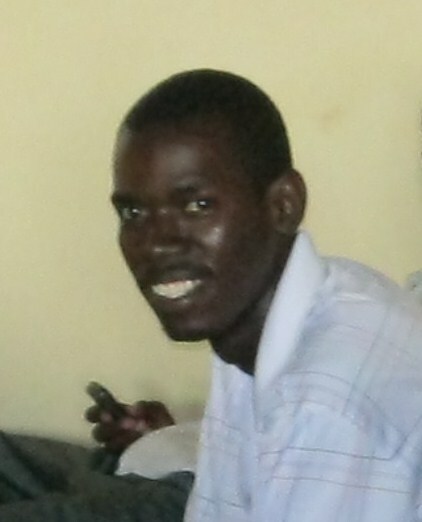 Through the ministry of Pastor Dale Barrett of TLC Haiti, Claudel is studying theology and will graduate as a pastor next year. He was able to complete his first year of law school with some financial help from an American donor. 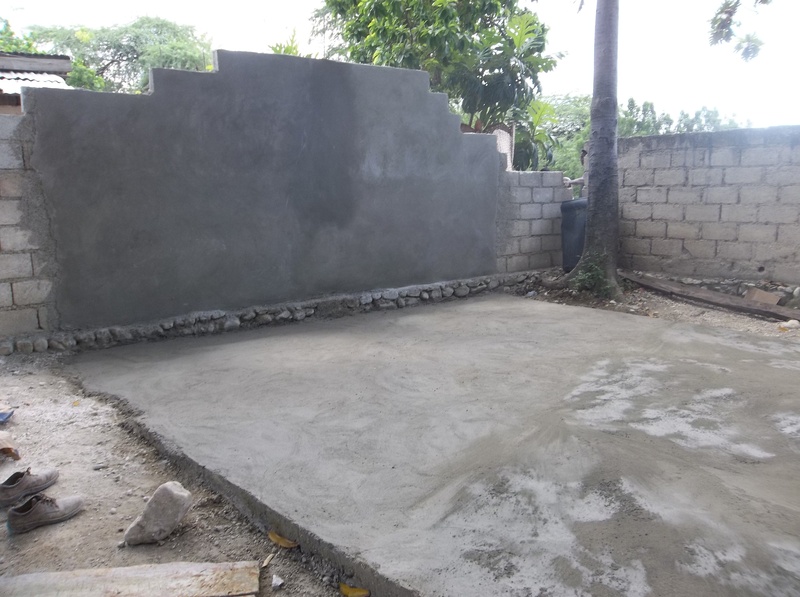 He is now in his second year and is praying and trusting God to provide the funds to continue to pay for his schooling. This remarkable young man is a pleasure to work with. He is eager to serve the Lord however He leads. He is a beautiful example to me of glorifying God by walking in faith no matter what the circumstances. His story is also a great example of how we as Americans can be a part of God’s work in poverty stricken countries by investing in the education of one individual for the glory of God! DREAM– something that you have very much wanted to do, be, or have for a long time, a strongly desired goal or purpose. Michelet hopes to become a doctor when he grows up. He is an 11 year old cutie who dreams of becoming a doctor one day. He lives with his mom who crushes rocks to earn money. 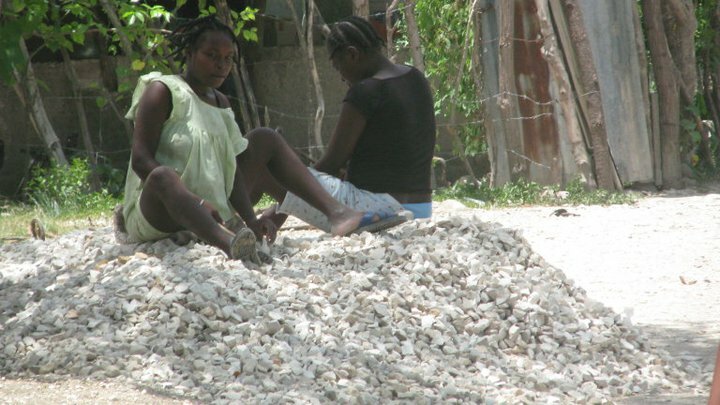 These Haitian women spend their days crushing rocks to earn money. Philomene would like to be an engineer when she grows up. At nine years old, her dream is to become an engineer. Her mom, who she lives with, is a trader in the market. Do you see the disparity? These children, like all children, have big dreams. Just like my children. Just like your children. 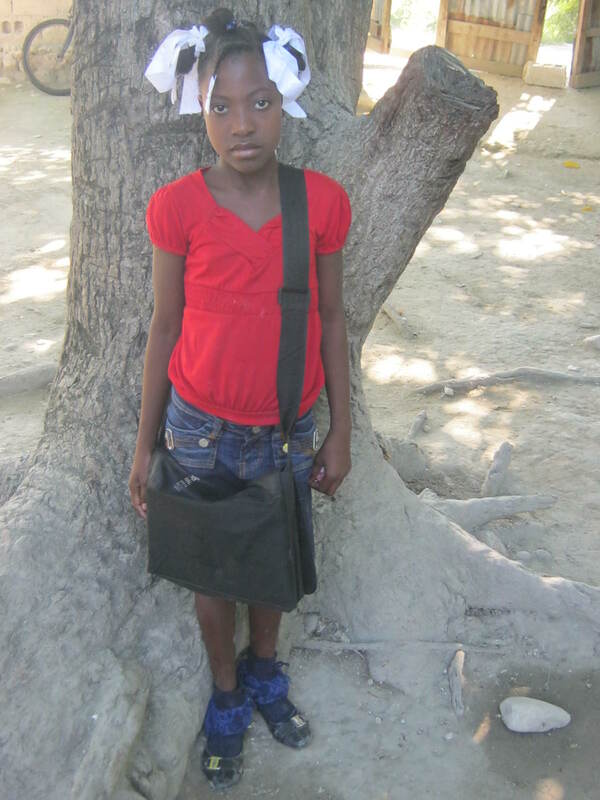 Many of these Haitian children dream of becoming doctors, lawyers, engineers or nurses when they grow up. Yet the family members or friends that these kids live with all do very different things for a living. Many of them are traders in the market. Some wash clothes. Or crush rocks. Some attempt to farm the depleted Haitian soil. Sometimes I look at a situation that is so big, and it feels hopeless. I see disparity in the fact that these children have HOPE that their big dreams will be realized in the midst of the poverty that surrounds them. But who am I to say that their dreams are too big for them? How am I to say that the problem is too big for God to work in? How do we change the world? 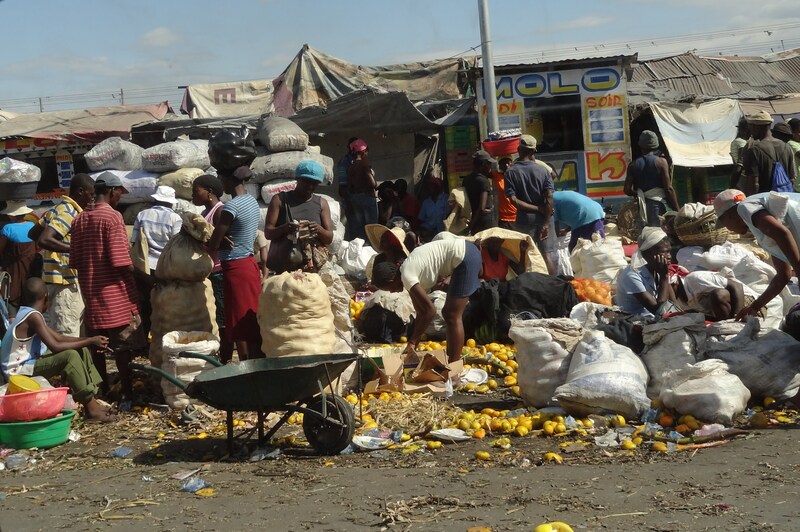 How do we change Haiti? How can we change just one little village? We serve one person. We love one child. 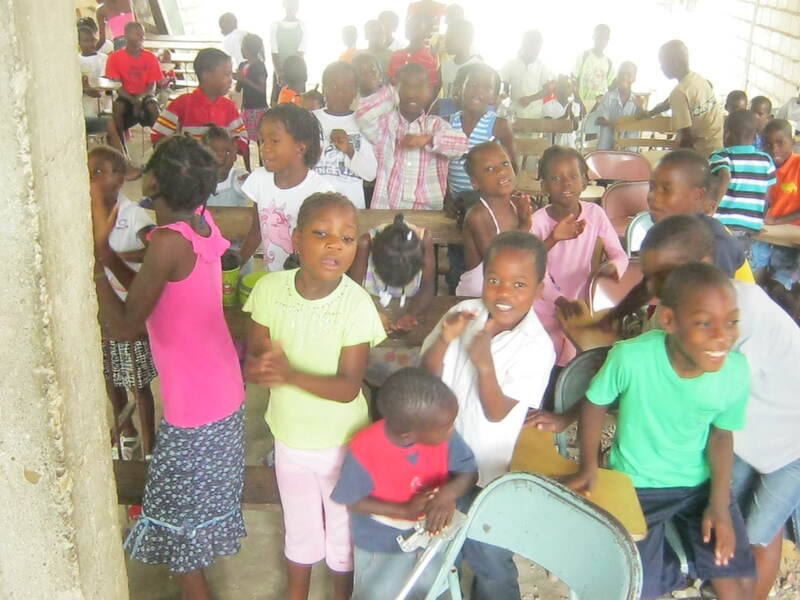 My prayer is that God will use this ministry to enable us to each change one child’s world. May God use us to help make those big dreams a reality! You can see more of our children & their big dreams at this link. A fishing boat in Haiti. Do you ever feel inadequate to fulfill the calling God has placed in your life? After I got home from Haiti a little over a year ago, I felt strongly that I needed to spend more focused energy being a parent and homeschooling mom. You see, I tend to have a one track mind, so when God gave me a vision & a passion to begin this ministry, I put all my energy into it… and that meant less energy for teaching my children. My husband & I have always felt that our children are our first ministry and when God called me to start The Bridge, that did not change. So for the past year, I have focused more on our kids, but sadly I feel like I have not done enough with The Bridge. 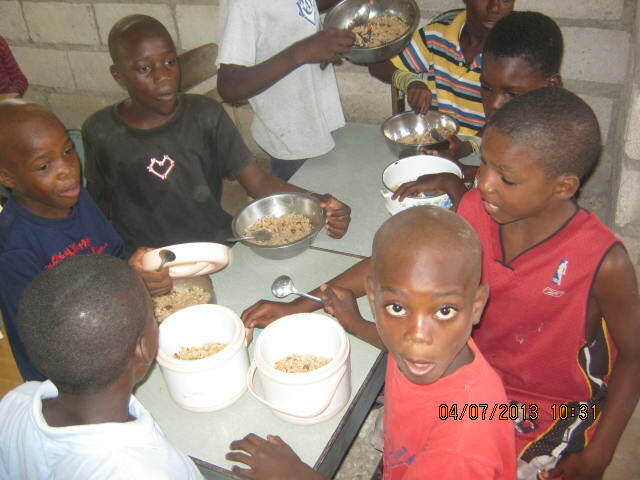 I want to be doing so much more with this ministry: I want to do more to connect our sponsors with the children, recruit more sponsors, post to this blog more often, plus I want to start exploring other ways that the school can earn money to help feed & educate the students of Carrefour Poy. I am learning that with both of these important ministries in my life, I have to rely on God’s strength every single day. I am learning to balance my time better; certain hours are for homeschooling and certain hours are for working on The Bridge. (Don’t ask when the “clean the house” hours happen. Ha!) I am learning to have patience and trust in God’s timing. When a family emergency prevented us from doing a presentation about The Bridge in front of our church, I am remembering that God’s timing is better than my own. When I am not getting questions answered because of third world technology or electricity problems or because my own computer broke, I am reminded that God is greater than technology. When Debby, who has been my assistant in this ministry from the beginning stepped down recently, I remember that God is in control and that His grace is sufficient for me! I need to remind myself on a daily basis to keep my eyes turned to my God who is the Author & Finisher of my faith and Who gave me the vision for The Bridge & will provide for all my needs and the needs of His precious children in Haiti. And I am thankful for all the ways He has provided for me already… including a husband who has stepped up & offered to help with this ministry when I need it, and who always helps with our family (including when we do find those elusive house cleaning hours).